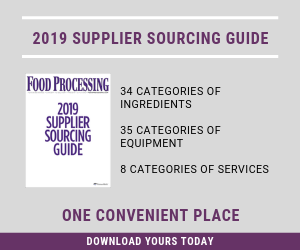 See which ingredients Food Processing’s editors hand-picked to highlight for this month’s issue of Food Processing magazine. The following products recently appeared in the Ingredient Round-up in our January 2018 issue of Food Processing magazine. To download your own copy of the digital version, visit our January page. Hojicha is a green tea flavor of Japanese origins with burnt, malted and tea leaf note. It's available for various applications, including: tea, milk, liquor and syrup. The flavor is free of additives, colorings and alcohol, and is halal certified. Achieve balanced, sustained energy with a clean label with Sustra 2434 slowly digestible carbohydrate. The ingredient promotes a lower glycemic index and steadier blood sugar levels over an extended period, leading to balanced, long-lasting energy. Made from native corn starch and tapioca flour, the ingredient is gluten- and FODMAP-free and has no adverse osmotic or digestive-tolerance effects, and is said to be ideal for energy-focused nutritional products including bars, shakes, mixes, snacks and supplements. Protein and fiber are known for creating a feeling of fullness and therefore helping in weight reduction and maintenance. The ingredient vendor has combined 15g of its Lacprodan whey protein and more than 3g of fiber into a prototypical, 100ml, pre-meal shot. In addition to being high in protein (15g), fiber (>3g) and calcium and a source of phosphorous, it induces a lower blood glucose rise after consumption, according to studies done in collaboration with researchers at the University of Newcastle in the UK. With the organic market expected to grow by 60 percent between 2016 and 2021 to $745 million, the company's portfolio of 20 seasoning blends is pending organic certification with QAI. The initial launch features five seasoning blends in each of four product categories: dairy, barbeque, sweet and heat. The company worked to overcome challenges related to supply chain and sourcing, seasoning development, manufacturing/blending, third-party certification and regulatory support to offer certified USDA Organic ingredients. To answer rising interest in blue cheeses worldwide, a line of cultures has been developed for blue cheese applications. To date, the range includes four products. Three Flav-Antage blue penicillium roqueforti in liquid form are designed to bring the typical colors of blue cheese, develop its uniquely delicate to tangy taste and deliver the texture found in cheeses such as Gorgonzola, Danablu and Stilton. Lalcult Blue LN1029, a heterofermentative gas-producing culture, relies on a strain of Leuconostoc mesenteroides that perfectly opens the curd of soft blue cheeses to allow for the blue mold growth. Passionfruit is becoming a staple flavor and key ingredient in the food and beverage industry. The exotic fruit is said to be versatile in a variety of foods and beverages, and has the potential to impact American cuisine. According to the company, the ingredient will help make food and beverage products stand out in dessert, drink and confectionary applications. Maltrin FM fast-melt maltodextrin is designed to quickly melt in your mouth with no grittiness or unpleasant flavors. The fast melting action and neutral flavor is said to make it an excellent carrier of other ingredients. The fast-melting powder can be applied directly into the mouth with no water needed and quickly dissolves releasing the active ingredient, flavors and/or other ingredients. 20 years of research has found wild blueberries, particularly the antioxidants within, have many health benefits. Wild blueberries can aid: brain health and cognition, cancer, diabetes and metabolic syndrome, gut health, hearth health and general metabolism. Researchers also have found that many impacts are interrelated -- what affects the eyes affects the brain affects the gut, etc. ProTherma hydrolyzed whey protein is an agglomerated hydrolyzed whey protein for hot, ready-to-mix powdered beverages and foods. The protein is designed to withstand high temperatures giving it the ability to stay soluble and stable when added to hot water and is said to function better than conventional whey proteins, dissolving completely with no coagulation. Made of 85 percent high-density, low lactose protein, it is a convenient way to achieve protein fortification in hot ready-to-mix powdered applications that include coffees, teas, hot chocolates, malt drinks, soups, oatmeals, coffee pods and coffee creamers. DouxMatok is a sugar reduction technology developed, tested and optimized to make sugars with enhanced sweetness while enabling the reduction of up to 40 percent less sugar per serving. Due to its similar sensory profile to sugar – it’s sugar-based and natural -- it allows consumers to get the same taste as sugar with significantly lower caloric value. It also has a similar energizing effect and no aftertaste. Nucane is a patented, clinically proven low GI sugar cane with the potential to transform the food & beverage industry. It will be introduced to the market in Q1 2018. It’s aimed at combatting the global obesity and diabetes epidemic via partnerships between sugar mills and brands to increase healthier options for consumers worldwide. Nucane can be used in all forms of food & beverages including retail, soft drinks, breakfast cereals, baked goods & quick service restaurants. It’s currently being used in product applications by food manufacturers in four countries. Unlike typical zero calorie sweeteners, Lohan-50, a zero-calorie monk fruit sweetener, presents no flavor challenges or difficult-to-mask afternotes. It claims to have no bitter or “off color” compounds from monk fruit. An apple-sized, green gourd fruit from the same family as watermelons, the monk fruit is revered for its sweet and wholesome properties. The sweetness of monk fruit is attributed to a group of saponin antioxidants known as mogrosides. Lohan-50 is standardized to 50 percent mogroside 5 content and comes as a pure white powder. Stable throughout the pasteurization process, 100 percent soluble and organic compliant, it’s suitable in all types of formulations, including dairy. Many high fiber foods like inulin, corn, wheat, dextrin and IMOs are high FODMAP fibers often associated with uncomfortable side effects like excess gas and bloating, giving a challenge for those with IBS to get the recommended daily intake of 25-30g of fiber. Sunfiber, made from guar bean, has just been certified as Low FODMAP, and is also confirmed by the FDA as a dietary fiber. The organic, Non-GMO Project Verified ingredient can be used in formulations for baked goods, cereals, snacks, beverage, dairy, medicinal foods and supplements. Frutaceuticals is a fruit-based delivery system designed as an alternative for pill and gummy supplements. The ingredients are made from real fruit and deliver the taste and texture of fruit chews. The fruit pieces, flakes, shapes and pastes are produced using a process that quickly evaporates moisture from heat-sensitive fruits and maintains the raw material’s integrity to create stable products that do not need added sugar, bulking materials, or preservatives. Simplify production and save time and energy with Palsgaard SA 6615, a palm-free powdered cake emulsifier that sustains product quality and produces moist cakes. Emulsifiers based on palm oil, particularly where the latter is produced in accordance with RSPO (Roundtable of Sustainable Palm Oil) principles, are known to be more sustainable in yield and functionality than those that produced from other crops. While palm-free ingredients do allow new label claims, Palsgaard SA6615 extends the range of options brands can select to meet consumer preferences, according to the company. The ingredient is is sustainably produced, sugar-free, gluten-free, non-allergenic, non-GMO and Kosher/Halal certified.